For me, summer is all about trying things that are bright and bold. A punchy orange dress, white nail polish, and these statement sunglasses from Under Armour in shiny marble - easy pieces making a huge impact. This week has been decidedly grey however, not a single day have I needed to wear these fabulous sunglasses; it has been nothing but rain and crazy thunderstorms. I don't delight at the idea of needing to take my rain boots for a spin, I am a fair weather blogger. that clutch! it's so awesome. You have a way of finding the cutest things. Beautiful clutch and you look gorgeous in these photos. Love orange on you. Such a great look! I love how you went simple (but bright) with the dress and then printed and fun with accessories! You look stunning. that clutch is so neat! You look fabulous! That color is amazing on you and I just love that clutch! Red suits you so well and this clutch is everything! Love the orange-red shade on you! We've also had crazy rain the last few days. I'm hoping today it'll be done with! Ooooooh! I am digging the white polish! And this dress looks AMAZING on you! We've had rain and storms nearly everyday also. Kind of refreshing for our dry climate, but kind of annoying for many summer activities. Because I never dress boldly in summer I love seeing others do it - and how fun is that dress? I love the color of your dress and the zipper detail! Your clutch looks so good with it! The color and cut of the dress are so flattering on you. It's been unseasonably grey and cold here for the past couple of days, so I've been rocking my regular glasses nonstop. Love the color of the dress, and the white nails look great! Great outfit. That dress is so bright and pretty, and I love it with the colorful bag too. I hope sunny weather comes your way soon! This is amazing from head to toe. Love it on you so much. The clutch is perfect with it. A front zipper is a neat detail too. It's rare to see. This red is gorgeous on you! This color is great on you and I love this clutch too. Isn't that always the way? You get fabulous new sunglasses and suddenly, the sun disappears! Murphy's Law, I guess. I'm glad you decided to wear them anyway... new things should always get their day in the sun, no matter what the weather. Plus, they look so fabulous with your red dress. I don't know if I've ever seen you wear this much red but I love it! Such a great colour on you. You are gorgeous in that orange dress! It is a lovely day to night option for summer! Love the color! It is perfect for summer. I've been trying to find a dress in that color too! the clutch, zipper on the purse, darling silver shoes, I LOVE THIS LOOK! Your dress is so pretty and the color is perfect on you! And I love your clutch! You look great! woo wee that dress is cute!! its gorgeous on you!! Love the accessories and the new trend of ur dress. That clutch is such a stunner! I love this color dress on you. I love your woven clutch. It's such a great touch of colorful pattern to any outfit what you pairing it with. You look so pretty in your new sunglasses and lovely dress. It's always great idea to wear vibrant colors to brighten up rainy day. Can't decide which I love more, the dress or that clutch! Both are such great pieces! Another awesome dress accessorized perfectly! Well done. I love these pops of color! That bag is perfection! 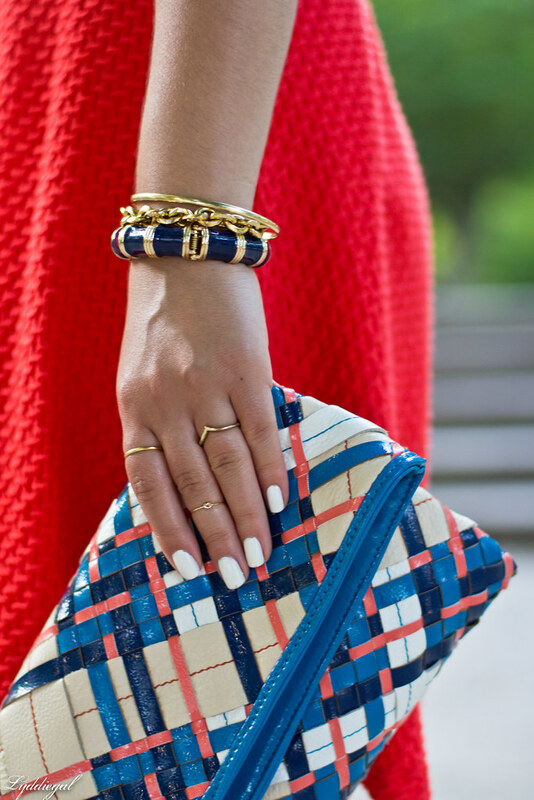 Love the pop of colour and your clutch is beautiful! Have a great day, lovely. 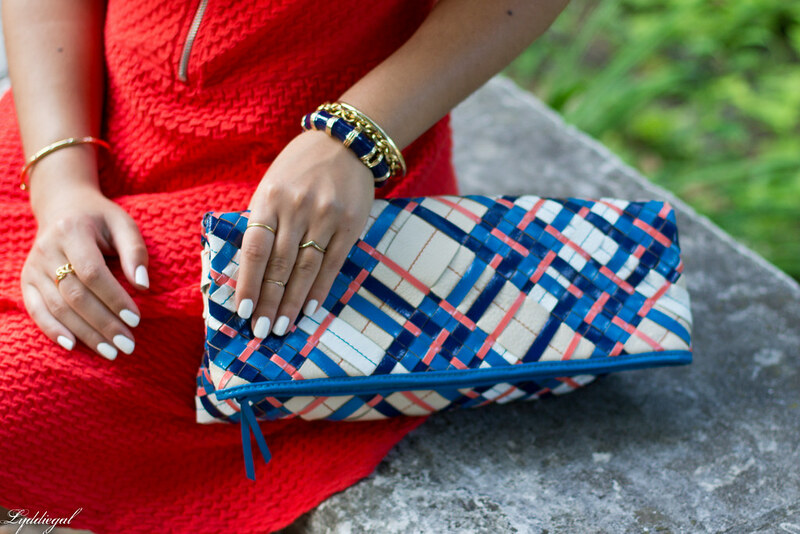 I love that woven clutch! I wish they carried such things in England's answer to TJ Maxx, TK Maxx. Stunning dress and red really suits you! Goes well with your skin tone! This dress is just adorable and I love what you styled it with all the way to the nails. Beautiful dress and clutch Lydia! Those sunnies are sharp! I have always wanted to do a white mani, but I always think it won't look right on me. I think I just may try it out this week! 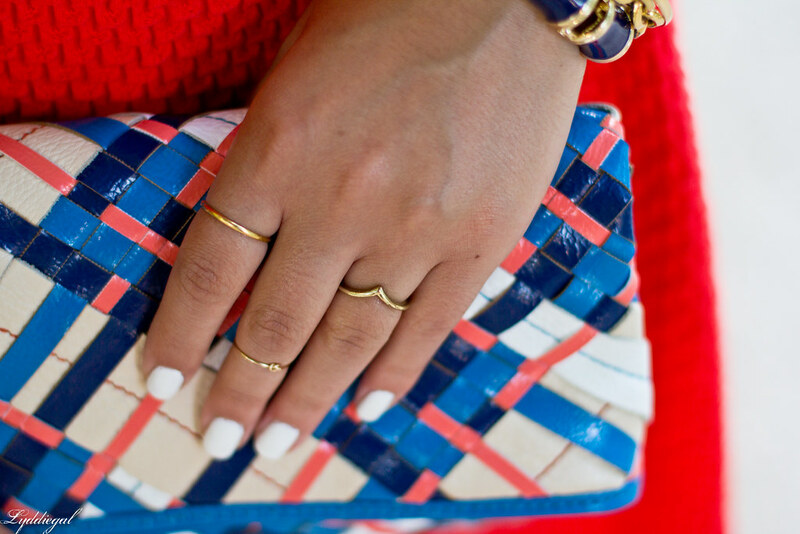 Oh, the white mani+dress+clutch are a total winner combo. I had my nails in white last week and constantly kept looking at them as i am still getting use to them.